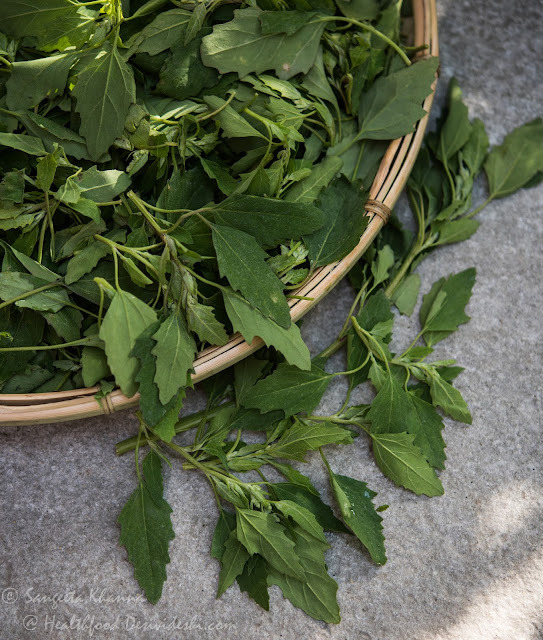 Continuing the saga of saag (leafy greens), I am here with another green leafy veggie, Bathua in Hindi and Bathu in Punjabi, Lamb's Quarter (Chenopodium album), this green has a very distinctive taste and becomes very creamy in texture when made into a paste. 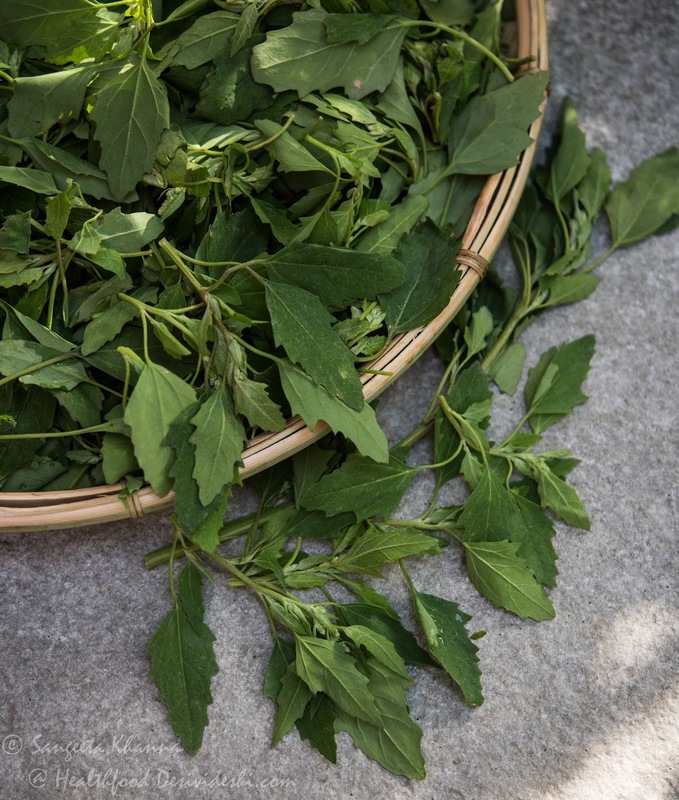 Updating this post with pictures of bathua ka saag (Chenopodium greens) as there have been requests for a picture of bathua saag. Bathua is very rich in minerals, Vitamin A and B complex and very good source of essential amino acids, most importantly in tryptophan see here and here . Healthy fats high fiber food is great but you need all you nutrients right? Choose your ingredients wisely and you will never regret missing out on taste or nutrition. This has been my way of getting my everyday nourishment. Bathua is rich in iron and calcium and if you get a recipe that is low on fat and tasty too, you know you can use it to your benefit till this green is in season. Most of my recipes on this blog are more ideas than recipes in fact as I convert some traditional ones into low fat ones or sometimes combine n cook some healthy vegetable in such a manner that they confirm to the low calories high fiber diet plans, without being limited to those salads and grasshopper smoothies. Having said that, this recipe may be compared to a grasshopper dip, if not a smoothie. But for your information it is a proper traditional recipe, belonging to the eastern part of UP. Much liked in my family and most of the times there is a bowl of this lying in the fridge as it keeps well like most green chutneys. In the last a generous dash of mustard oil is added for a piquant twist, the MO can be replaced with EVVO but I recommend mustard oil strongly. Isn't it simple ?? We enjoy eating this with hot rice and radish slices most, but it can be enjoyed smeared on chapatis and rolled with some onion or radish slices. 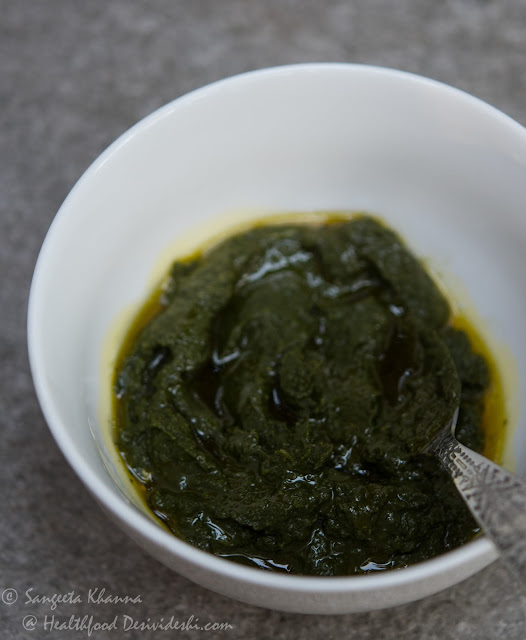 Let your imagination go wild with this chutney or dip or bathue ka saag as we call it. As a dip it is so very good for khakhras. You can have it with nachos, mix it with boiled chickpeas or cubed fresh paneer and you low fat subzi is ready. Must have in the fridge I say. bathua bathua ka saag everyday subzi/curry for the dieters for diabetics these foods helped me loose wt. MMm looks yumm and the pot with little garlic sprouts looks sweet. Wow! 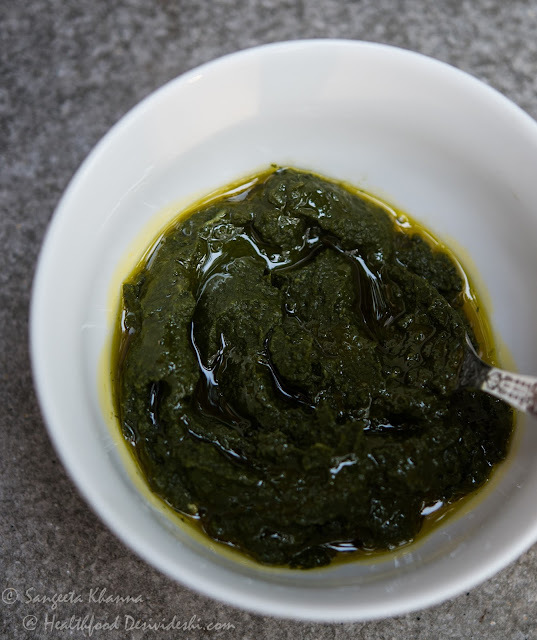 Your spicy leafy green dip is eye popping...Very healthy. The mustard oil must really kick-up the flavor at the end. Dipping radishes and other vegetables ensures that this dish stays healthy. P.S. I am a follower of your blog too! Sangeeta, this dish looks wonderful.. it had me craving sarson ka saag instantly! Looks like garlic pods are doing great! Sangeeta nice dip. i have eaten bothua shag in chachari, a bengali dry fry kind of dish. love its flavour. 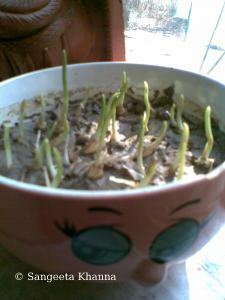 the garlics are growing very fast. This is a great idea! We use bathua routinely in parantha's and raita. But never had it in this form ever. I too use this greens regularly..tastes so good with just a few ingredients...a sort of comfort food for me...nice pictures! Saag in Punjab we call it as Saag!! My mom is coming tomorrow and i am going to tell her to make come for us!! This is nice dish. I do some thing like this with radish leaves. I will try as I eat hell of a lot Bathua in the season. yummy and healthy I am so into dips at the moment ! Trptophan and Seratonin...I can talk for hours on this topic. :) Good to see many greens posses all the essential amino acids. Wish I get them here. :) And the recipe sounds very saathvic. 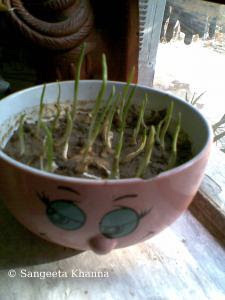 Garlic greens, never had a chance to see them...thanks for sharing the picture. I never thought of making green amaranth like this..always made palak paneer by making its paste..will try it. Thanks Malar ...i need tryptophan n serotonin in large quantities right now..
thanks for the award ..
loved your recipe. its delish!! lovely to see such effort being put into sharing knowledge on saags we are losing touch on..especially in metro cities, thanks a lot, keep up the great work! its so simple sounds like potato mash with mustard oil! just put kachcha (raw) mustard oil over the mashed boiled saag and its done? I must try it today, though have been eating this and many more back home, its a rare find here and I googled to get to know a recipe to cook it in saag form. Thanks :-) keep in touch. If you'll add few drops of lime juice into it it will enhance Iys taste. My gradma used to make it almost everyday throughout winter season. Thanks Prapti. We sometimes add buttermilk or dahi to it but will try lime juice next time. This is a wonderful tip for bathua ka saag. Thanks again. Hello, came across your site recently and find it interesting. I've just been introduced to a green called " Naari" saag by my sabziwala...had never heard of it earlier and am looking for recipes for it. Seems it is also called Kalmi saag or water spinach. Was wondering if you have any info and recipes on this. 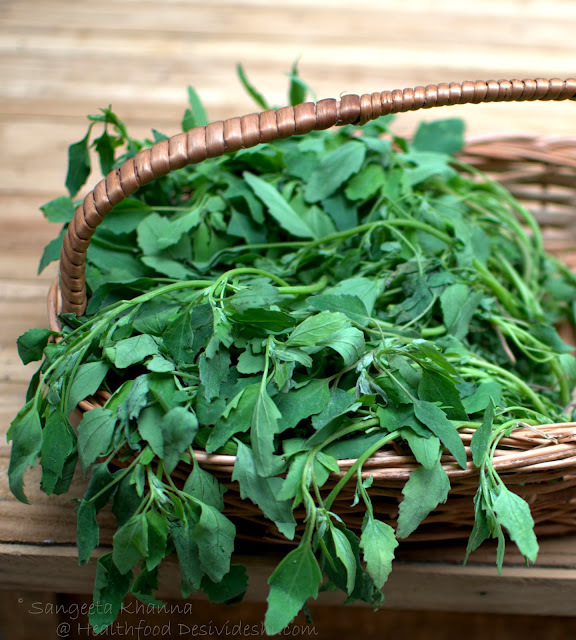 The water spinach can be cooked like any other greens Aprajita. Will post recipes soon.